Corporate Executive Chef Haley Gabel Bittermann of Ralph's on the Park in New Orleans, Louisiana shares a delicious taste of New Orleans with a delectable three-course menu from the Ralph Brennan's New Orleans Seafood Cookbook with Gene Bourg. I would like to congratulate Haley on achieving top toque status, not an easy feat for a woman in a predominantly male profession. Having met Haley while I was the Guest Bar Chef with Edward F. Nesta for a Spirited Dinner at Ralph's on the Park as part of the Tales of the Cocktail in July 2008, I learned that hard work, passion, and an affable personality, has taken her far from her original career choice - medicine. Her mother did cardiac research, her grandfather was a doctor, her father did research, and she was pre-med in college, however while she was in college, she worked at a restaurant as a bus girl and was bitten by the restaurant bug. When a friend went to culinary school, she soon followed, attending the Culinary Arts Academy of Cincinnati, an affiliate of the Culinary Institute of America. When a pre-graduation externship opportunity came up at Mr. B's Bistro in New Orleans, she accepted and fell in love with New Orleans. She returned to culinary school for graduation, and then returned to work at Mr. B's Bistro. 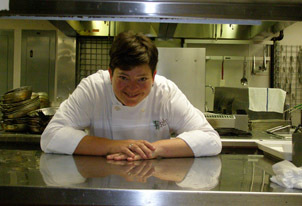 Three years later she became the Executive Chef at Bacco, in 2000, became the Corporate Executive Chef, and in 2005, she added the role of Director of Operations for the Ralph Brennan Restaurant Group in addition to her Corporate Executive Chef duties. Haley has progressed through the culinary ranks, has appeared on television, cooked for international dignitaries, and is passionate about her career choice, but when addressing culinary school students she advises them "not to go into this profession because a) you want to be on television, or b) you want to make lots of money. You might obtain both, but maybe not. There is constant stress in the kitchen; you have to love what you are doing as the hours are long oftentimes working and standing for 18 hours. Your motivation has to be the guest; I look at the restaurant like I am inviting people to my home, as the Southern hospitality of New Orleans is what makes it worthwhile. I love it when a guest tells me that they were dreaming all week about what they would eat at Ralph's on the Park and that they had a great experience; that is my motivation." Although her mother cooks a few things very well, her fondest food memories were of her paternal grandmother's cooking. Her grandmother was also her inspiration, as her grandfather was a diabetic, and her grandmother would make create two versions of everything, one for the family, and one for her grandfather. From her grandmother, Haley learned how to take a creative approach to food and how good a recipe could taste without sugar. Although not born and raised in New Orleans, she has fallen in love with the city. What she enjoys best is the amazing food culture; the fresh seafood and produce is what makes the cuisine so special. Married to a fellow chef, the couple has a 12-year old daughter and a 2-year old son. Her daughter loves making pastry, but time will tell as to her future career path. Haley's culinary approach is "each day in the kitchen is an adventure, as the kitchen is ever evolving with much trial and error, creating recipes with thoughts on what is going to be the next best thing, what is going to be popular next year. This is not a job - it is my passion!" Method: In a medium-size non-reactive mixing bowl, dissolve the dry mustard in the lemon juice. Stir in the mayonnaise. Gently fold in the red and green peppers, capers, parsley, mustard, horseradish, black pepper, tarragon, pepper sauce, and egg. Serving suggestion: Cover the sauce and refrigerate it at least 1 hour or up to 4 hours, until ready to serve, then taste and adjust seasonings to your liking. Method: Heat the butter in a heavy-bottomed 2-quart saucepan over medium-high heat just until melted. Reduce the heat to low and continue cooking about 2-minutes until a layer of clear golden liquid (which is the clarified butter or butterfat) has developed between the foam on top and the milk solids and milky water that have separated from the butter and sunken to the bottom of the pan. Remove the pan from the heat, and skim and discard the foam on top. Ladle the clarified butter into a clean pan or large glass measuring cup, being careful not to include any of the milk solids and water as you work. Discard the milk solids and milk. Use the clarified butter immediately or let it cool briefly, then store in an airtight container in the refrigerator for later use. It will last up to 1 month. Method: At the last moment possible, make the Hot Butter Sauce. Keep it warm as directed in the recipe while frying the tomatoes. Place the pepper sauce in a heavy non-reactive 2-quart saucepan. Cook over medium-heat, until it is reduced by half (about 2 tablespoons), 2 to 3 minutes, whisking constantly with a metal whisk. Whisk the cream into the pepper sauce and bring the liquid to a boil. Reduce the heat to low and add the butter, 2 pats at a time, whisking constantly, until all of the butter is added and incorporated into the sauce. Each addition of butter should be almost completely melted in before adding more. This will take 5 to 10 minutes total. Remove from heat. Whisk in the kosher salt and pepper. Use the sauce immediately, or keep warm in the uncovered top of a double boiler over warm (not simmering) water for no more than 1 hour before using. *South Louisiana's Creole tomatoes are preferred for this recipe, although other good, peak-of- season regional varieties can be used also. Fried Green Tomatoes Method: Trim both ends of the tomatoes minimally as possible. Cut each tomato into ½-inch thick slices. You will need a total of 12 slices. Arrange the tomato slices in a single layer in a 9x13-inch glass baking dish. Drizzle the Crystal pepper sauce evenly over the tomatoes and lightly sprinkle the tops with ½ teaspoon salt. Turn the slices several times to evenly coat both sides with the hot sauce marinade, and let them sit at room temperature for 20 minutes. Preheat the oven to 400 ° F (204° C). While the oven is heating, in a large mixing bowl thoroughly combine the flour, corn flour, cornmeal, oregano, thyme, paprika, chili powder, black pepper and 1.5 teaspoons of kosher salt. In a medium-size mixing bowl, whisk the egg until smooth, then whisk in the milk to make an egg wash. Prepare half the tomato slices for pan-frying as follows: Have at hand baking sheet lined with parchment or wax paper. One at a time, dredge a slice in the flour mixture, coating evenly and shaking off any excess. Next, submerge the slice in the egg wash, then dredge it again in the flour mixture, shaking off the excess. Place the slices on the prepared sheet as breaded. In a heavy, non-reactive, 12-inch skillet, heat ¼ cup butter over medium-high heat until hot, about three minutes. The butter is hot enough when a pinch of flour dropped into the pan floats and sizzles. Arrange the breaded tomato slices in a single layer in the skillet and fry them until they are golden brown on both sides and crisp and tender, two to three minutes per side. Drain them on paper towels. Drain any butter remaining in the skillet into a heatproof container, and wipe the skillet clean with paper towels. Add the remaining ¼ cup of butter to the skillet and let it heat while you bread the second batch of tomato slices. Fry and drain the second batch as you did the first batch. Now arrange the tomato slices in a single layer on a rimmed baking sheet lined with at least two thicknesses of paper towels. Bake uncovered until tomatoes are fork tender, no longer than three minutes. Remove from oven promptly. Serving suggestion: Serve the tomatoes immediately. For each serving, overlap two slices on a rimmed appetizer plate and drizzle 2 tablespoons Hot Butter Sauce over and around them. 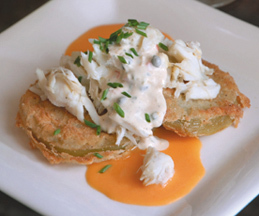 Next, place 1 tablespoon Ravigote Sauce on top of each tomato slice, and mound 1-tablespoon crabmeat on each slice. Garnish with the salad greens or a sprinkle of parsley or chives. Method: Thoroughly combine all the ingredients in a small mixing bowl and place the mixture in an airtight container in a cool, dark place for up to 3 months. Method: Place the unpeeled shrimp, Worcestershire, coarsely ground pepper, Creole seasoning, garlic, and 1-tablespoon water in a heavy 10-inch, stainless steel sauté pan. Squeeze the juice from the lemon half over the shrimp and add the rind to the pan. Over high heat, cook the shrimp while gently stirring and occasionally turning the shrimp. After 2 minutes of cooking, the shrimp should start turning pink on both sides, indicating that they are nearly half cooked. If the shrimp are the colossal size, now add 2 tablespoons water to the pan. Otherwise, do not add any water. Reduce the heat to medium-high and continue cooking as you gradually add the cold pieces of butter to the pan. While turning the shrimp occasionally, swirl the butter pieces until they are incorporated into the pan juices, the sauce turns light brown and creamy as it simmers, and the shrimp are just cooked through. This will take about 2 minutes total if the shrimp are extra-large, and about 3 minutes if they are colossal. Do not overcook the shrimp. Serving suggestion: Pour the shrimp and sauce in a heated pasta bowl with the lemon half turned cut-side down in the center. 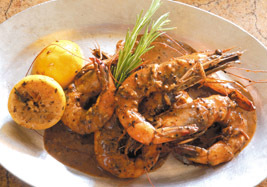 Serve the shrimp and sauce immediately, alongside slices of warm, crusty French bread for sopping up the sauce. Before you begin, if you are using caramel sauce prepare the recipe in advance. Method: In a large mixing bowl, whisk together the 3 large eggs until frothy. Add the sugar and 1teaspoon kosher salt, whisking vigorously until the sugar is thoroughly dissolved. Whisk in the cane syrup, corn syrup, melted butter, and bourbon. Set the filling aside at room temperature. Cut the butter into ¼ inch cubes. Let the cubes soften at room temperature for 15 minutes. Meanwhile, generously butter a 10-inch metal pie pan, and dust with flour. Set aside. Preheat the oven to 325 °F (163 °C). In another large mixing bowl, thoroughly combine 1¾ cups flour with ½ teaspoon kosher salt. Add the slightly softened butter cubes and quickly work them into the flour with a pastry blender or your fingertips until the mixture looks like coarse meal with just a few pea-size lumps of butter in it. Add the vinegar to 1/3-cup cool water. Gradually add the vinegar water to the flour, tossing lightly with your hand or a fork until blended in. Gently gather the mixture together to form a ball. If it does not hold together, add another ½ tablespoon of water at a time until the mixture is sufficiently damp to hold together, using as little water as possible. Shape the dough into a smooth 5-inch disk. With a floured rolling pin, roll out the dough on a lightly floured surface into a circle about 14 inches in diameter and 3/8 inch thick. Very lightly flour the dough, fold it in half, and carefully transfer to the prepared pan. Unfold the dough and gently fit it into the pan. With a small, serrated knife trim the excess dough flush with the outer rim of the pan, then pat the dough around the edge to neaten it. Chill the pie shell for three minutes to firm it slightly. Remove the pie shell from the refrigerator and crimp the edge. In a small mixing bowl, whisk together the egg (any size) and the milk, blending well. Brush a generous amount of this egg wash on the crimped edge with a pastry brush. 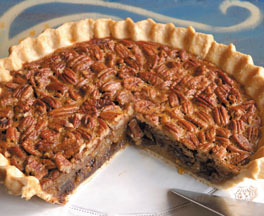 Evenly scatter the pecans and chocolate chips over the bottom of the pie shell. Thoroughly stir the reserved filling, and then slowly pour it over the pecans and the chocolate chips. Use a fingertip to gently stir the filling to coat all the pecan bits and chocolate chips to evenly distribute them within the filling. Bake the pie on the middle shelf of the oven until the center of the pie feels firm and bounces back when gently pressed with your fingertips, and the crust is golden brown, approximately one hour. Transfer the pie to a metal rack to cool to warm room temperature (about 1 hour) before serving. Serving suggestions: Serve the pie at room temperature or warm. If made ahead, let the pie cool thoroughly, then cover it loosely and refrigerate overnight. To re-warm, briefly heat in a 300 °F (149 °C) oven. If using caramel sauce, drizzle about 1 tablespoon of it around the edge of each dessert plate and position a wedge of the pie on the plate. If desired, top the pie with vanilla ice cream or lightly sweetened whipped cream, and garnish with a mint leaf and a light sprinkle of powdered sugar on the pie and plate. Method: In a heavy 1-quart saucepan, bring the cream to a boil over high heat. Add the brown sugar, whisking thoroughly. Whisk in the granulated sugar and continue cooking and whisking about 30 seconds more. Remove from heat. Cut the piece of vanilla bean in half lengthwise, scrape the tiny beans into the sauce, and whisk to blend. Serving Suggestion: Serve the sauce while it is still warm, or once it is cool; store it in the refrigerator in an airtight container until ready for serving. It will keep for at least one week covered and refrigerated. Reheat for serving in the top of a double boiler over hot (not simmering) water, whisking constantly to keep it from scorching. Note: Prepare the whipped cream at the last possible moment before serving. Place the mixing bowl and metal whisk (or electric-mixer beaters) in the refrigerator or freezer until very cold before whipping the cream. Place the very cold heavy cream in a chilled, large stainless-steel mixing bowl. If the temperature in your kitchen is above 80 °F (27 °C), set the mixing bowl in another bowl containing ice. Cut the piece of vanilla bean in half lengthwise and scrape the tiny beans into the cream. Whisk the cream vigorously until it is noticeably thicker. Add the confectioner's sugar and continue whisking just until soft peaks form (if serving with cake) or until stiff enough to form dollops (if using with other desserts). Do not over-whip or the cream will quickly turn to butter. Serve immediately. 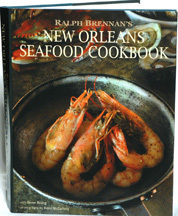 Read about Ralph's on the Park in the Restaurants, Liquor Cabinet, and Luxury Products - Gifts sections. Read other articles on the Tales of the Cocktail and New Orleans in the Destinations, Hotels and Resorts, Restaurants, Liquor Cabinet, Awards, and Luxury Products: Gifts sections.